The City of Edmonton maintains the various structures in play spaces and playgrounds. 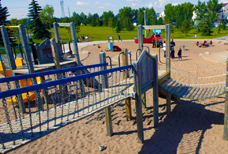 The City of Edmonton has many play spaces and playgrounds with structures requiring upkeep. Help us to keep our playgrounds and surrounding areas safe and accessible by reporting maintenance needs. Report any damage to playgrounds or play space structures using our self-service reporting tool. The City assesses the damage and makes any replacements or repairs as required.